The future of the connected car in Volkswagen is now the present. The company works on various projects with the aim that their vehicles allow their users to access from inside the passenger compartment all the information they may want, but also to make their driving safer and more efficient. So that getting behind the wheel is a personalized experience in a global world. Projects that also contemplate autonomous driving and intelligent vehicles that not only know, but also learn. And, if driving has always been an interaction with the environment, with the car now connected that environment enters the vehicle but, in addition, in an orderly manner and depending on the interests of the driver. This last idea is part of the We Commerce project developed by Volkswagen together with IBM, which aims to offer customized digital services to the user. After obtaining the driver’s permission, the cognitive skills of the IBM solution will allow these services to learn from the preferences and habits of the client in order to make recommendations as personalized as possible. They contemplate from retail stores to gas station chains, the hotel sector or restaurants that, in fact, can use We Commerce also to offer their services and products in a segmented way. Volkswagen also works with NVIDIA to match its future range of vehicles with artificial intelligence, key in turn for the development of digital interconnection, mobility without emissions or autonomous driving. Volkswagen, in this sense, works on the development of an “intelligent co-pilot” that would include assistance and comfort systems based on the processing of sensor data, both inside and outside the car. The idea is that this co-pilot with the capacity to learn -that is, that the systems can be improved throughout the life of the vehicle- will be integrated into the ID family, with which Volkswagen, starting in 2020, will launch its offensive. electric cars and will gradually introduce autonomous driving. Starting from the NVIDIA DRIVE platform, functions such as facial recognition for unlocking the car from the outside, alerts to the driver by the presence of bicycles, gestural recognition for user controls, natural understanding of the language with a voice control without fail and follow-up look for alerts by driver distraction. 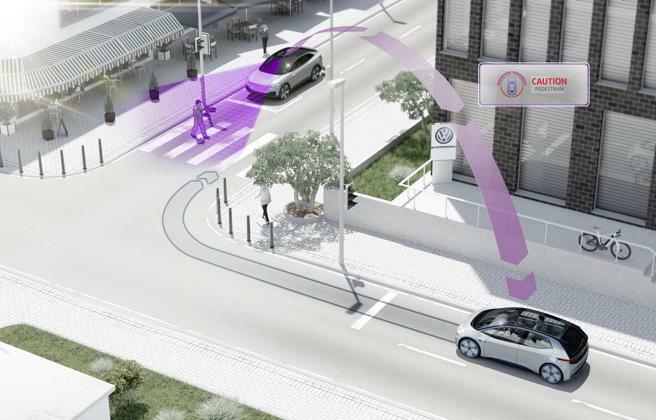 Although in the field of autonomous driving, Volkswagen together with Mobileye, one of the world’s leading manufacturers of accident prevention and autonomous driving technology, also plans to launch a new standard of autonomous navigation. What will it consist of? Vehicles equipped with front cameras will obtain information such as lane marking and the road that will be transferred in compressed format to the cloud. These data will be used to continuously optimize high-definition navigation maps. The high precision can allow autonomous driving, beyond making possible also the advanced development of many assistance systems. These projects are a significant sample of the bet that the automobile is making in the new technologies sector. In fact, the group at the end of 2016 began a recruitment that will end next year and that will, in just three years, the company have attracted more than 1,000 IT experts from around the world.